What Fragrances Did You Wear Last Week? It’s been a riotous week here in Sydney. So much happening and I was so involved I forgot to take photos of everything so here’s a smattering of what my week looked and smelled like. KFC Brunch with buddies and BFF Kath’s family. It was short and sweet because I had to work that night, fun though. Hosted the most sensational Hen’s Night that night. The girls were hilarious and we had a wonderful time. Pedi Sunday. You can tell my Hobbit feet a mile off. Yum Yum Cha Cha Cha with the crew. These are the heart of my friends circle and I love them. Sunday night the JACKPOT went off at Austral Bowling Club. $1000 split 4 ways. Wonderful. Tuesday it was head shave day and now you can see why I get it done so regularly. What a spunky barber. So sweet and he does a good job too. Down at the local pool I’m up to 700m. Weather is perfect for getting my swim on. At 9am I have the pool pretty much to myself. Morn to Dusk by Eau d’Italie: A vanilla-centric fragrance that is perfect for me. It’s warm, sweet and I’m surprised it doesn’t have more notes because it tells a beautiful story. Divine EdP: Old fashioned BWF glamour done for the 21st century. I know it’s older than that but never feels dated or retro. Mohur by Neela Vermeire Creations: All the roses set as a centrepiece with an enormous backing lineup that makes Mohur smell only of itself and slightly different every wear. The Aoud by Mancera: Simple synth oudh with a minty kick in the heart and a longevity that beggars belief. Don’t get it on your clothes because they still smell after washing. I love this baby though and wear it quite a bit. Tokyo Bloom by The Different Company: Lovely soft green cologne. Wears for me like an EdT but loads of people have problems with its longevity. Like walking on grass after the rain, so fresh and alive. Antaeus by CHANEL: Just scored this vintage tester and it smells exactly like the bottles we had of it in the 1980s/90s. Jin stole my other bottle so I had to replace and it was well worth it. YUM! Cabochard parfum by Gres: Not sure how old this baby is. I thought it was a vintage buy but it smells absolutely perfect, clear as a bell with that heavenly chypre dry down. Calm , cuddly and ever so elegant. Le Male by Jean Paul Gaultier: The original and best. One of my partners in the 1990s and I wore this exclusively for nearly a year. Good times, great memories. I just opened this new bottle so it’s getting quite a bit of wear. Boy by CHANEL: I had about 20ml left after I split this and it’s down to 5ml or less. I love it. Easiest wearing thing in my wardrobe right now. It’s very lavender-centric on me with a soft focus dry down of sweet nothings. I really like it. So! How was your week? What did you do and what fragrances did you wear? I wore a Narciso Rodriguez for Her Eau de Parfum last week. I bet you smelled amazing all week Annet Z. All of them? Well, Jicky to bed tonight, is the current as good as the vintage? Mohur today, as you say, it is different every time and today I was a pastry. Anubis by Papillon yesterday, it was cold and I needed the warmth of the leather and floral notes. Had a great time with the sales lady at Priceline this week,spritzing on all the testers and bemoaning the demise of Alliage! Yes, all of them, and some decants. I try to wear 3 separate fragrances a day but some days I’m so happy with one I wear it all day. Anubis is YUMMY! How fabulous that you got Mohur pastry, Spicy fruit rolls? Hi Portia! It’s transition time here in the US from sweltering summer to lovely cool fall. I wore a lot of Chanel last week. Eau Premiere and Bois des Isles smell especially terrific these days. I wore Misia all summer and haven’t stopped yet! The full bottle was a good investment. I’m looking forward to trying Boy, whenever I can get my hands on a sample. Sounds like a winner. You and your pals look like you know how to have fun! Misia is heavenly isn’t it. So old fashioned yet thoroughly modern, I love it too. Hiding away in my cupboard is a Bois des Isles parfum I think, must try and find it. What a fun week! And 700m! That is great! I used to swim competitively as a kid but I can’t even imagine it now…I haven’t put my toe into a pool for years. Congrats on the jackpot too! This week I have been using up the much appreciated Divine decant. It is a fragrance I smelled years ago and have been searching for ever since. 🙂 Now I have a bottle of my own too. 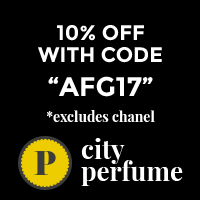 Also Peety (I love it, no matter what anyone says about AP), Moon Shadow (I agree with everything you wrote), Note Fragrances Citron Pomelo – a super powerful pomelo and Zoologist Macaque Nightingale. An interesting and diverse fragrance week. The rest of the time we have been working on Brahms f minor quintet and pulling potatoes. Excellent and interesting fragrant week for you, so glad you grabbed a bottle of Divine, it’s well named. Brahms f minor quintet and pulling potatoes!! What a dichotomy. This is fun and so was your week! I started with Grossmith Amelia – from a decant, next day Amouage Lyric – also decant, a sniff of Le Dix – miniature and later Parfum de Revolte from HdP – bottle; next day Louanges Profanes, decant again; day after that De Profundis, I really have to get a full bottle of this one; then Monsoon (original from decant) and later Shalimar (original from bottle); then all day Metalys from Guerlain, my sig, I love it and I’m constantly on the search for more, decants, anything!! ; next Phul Nana – from bottle; today All Good Things, also from bottle. From Lyric the mens version, which I like so much better than the womens…! Is De Profoundis not nearly the most exquisite smell…..I’d love a bottle ,too. OOOH! What a sensational week.Metalys is YUMMY, as are so many of your choices. I totally agree that De Profundis is special. You had a great weekend and enjoy your get together. I love Chanel Antaeus…….was my signature scent in 1980-90. Looking forward for Mohur by Neela Vermeire, The Aoud by Mancera and Cabochard parfum by Gres. Olivier Durbano is a clever perfumer. I like the little of his work that I’ve tried. Antaeus is superb, even the newest versions smell good. All of them? Lemme think…Taklamakan (gotta get a bottle before my samples run dry), Philosophy Fresh Cream, White Linen, Sultan Pasha’s Pure Incense, Florida Water, 4711, SMN Ambra, Cuir de Russie, Beige, Cuir de Lancôme, Stash, Flowerhead, probably a few I’ve forgotten. I was all over the place with perfume last week. I mostly worked outside, pulling weeds and taking the cats for walks along the river since the weather was conducive to frolicking and catching frogs. It’s been so hot lately that the cooler weather was really a treat, especially for the furry folk. I did take a day off to drag my mom out for some shopping and we pootled around Neiman’s on a very quiet Tuesday afternoon, pawing the merchandise and admiring the gaudy baubles. I’m so impressed by and envious of your swimming. I love to swim but don’t often get the chance and I doubt I could manage to stay in a lane much less swim a recognizable stroke. Stash, the newest release by ..OH GOSH..My mind has gone blank….the actress lol….is it full bottle worthy? Sorry for the late reply. Sarah Jessica Parker. I ended up with a rollerball and may one day need a small bottle. It smelled at first like a generalization of all the boozy-spicy niche drydowns, but I had to make several trips to Ulta and kept trying it. I started to crave it for itself by the third visit. I’ve worn it to bed for several weeks straight and have decided it’s so pleasant and cozy because it’s fairly straightforward and linear. I wouldn’t pay crazy niche prices for it but if it hits the discounters or I have a coupon I will buy a bottle or two. It doesn’t get on my nerves like most gourmands and doesn’t get raspy or sharp like woods and tobacco sometimes do, it’s also wearable in warm weather. What a wonderfully diverse frag week you had, some lovely choices. I used to love lazy department store afternoons with my Mum, they feel like you have forever. I have not been back to the pool since Wednesday and hope to go tomorrow morning. I love being in water at any time but swimming laps is like a gentle zone out from the world. Nobody is judging my crummy strokes and I get on with it. Very spiritually relaxing. Your week looks awesome! Mine was pretty much about rain, intense work, traffic, and heavy duty drugs for a massive bout of bronchitis. But there’s always perfume to Lift the spirits. Pretending spring had come to NZ I went for La Chasse Aux Papillons, La Tulipe and Grand Amour (not all at the same time …). Then, giving in to the reality of cold and rain, I went back to the comfort of Theorema and Safran Troublant. My most successful day though was when I put on a vanilla sample that turned out to be an absolute scrubber and I had to somehow hide the last traces. Tobacco Vanille will apparently hide ANYTHING and furthermore my nine year old nephew then gave me the great compliment of wondering what the nice smell was. Instantly it became a very good week. Bronchitis is so debilitating. I hope you get better soon. HA! Pretending it’s spring. Lovely choices to pretend with. Tobacco Vanille really will overpower everything, lucky choice. Do you think you may have a budding perfumista around? Happy Sunday morning to you , Portia. As weeks go it was a lean perfume one. For Monday and Tuesday I was in a pain-killer induced daze, so no scent except Deep Heat. Wednesday ,much less pain, and I’m sure I put something on…just cannot remember. Thursday was Gigli and Friday was a sample of Amourage’s Myths Woman. I wore this to work and had 3 separate compliments in 5 minutes of arrival!!! Yesterday ,because the weather was so pitifully Winterish ,I chose Theorema. Now it is the end of the week, and the sun is SHINING….so I’m going to take a tip from a Kiwi, and wear La Chasse Aux Papillions,and pretend Spring has sprung, like Malmaison. p.s. good news ,had some leave approved, so that was my highlight. Sorry to read you’ve been in pain killer fog. WOW! 3 compliments i 5 minutes is astounding. You must rock Myths Woman like crazy. I admit that I’ve not spent much time with the Myths other than to review. They seemed really interesting. Woman isa the narcissus one? La Chasse Aux Papillons is beautiful, yummy choice. Hey there Undina, How lovely to see you. I really loved Volutes, has it been D/Cd? I seem to remember reading that somewhere?? MdO Vanille is one of my favourite mid-season fragrances. Thanks for the reminder to grab it out again. I think they’ve discontinued EdT (I liked it more) but still do EdP. I wore Escada Magnetism and Gucci Flora Eau Fraiche last week. Mmm, Mohur and No.19! You smelled divine. That pool looks so beautiful. Developed asthma recently. So until I figure out what exactly is triggering it (could be so many things) I haven’t worn much scent. Still love to visit and see what the APJ crew is up to. So sorry to read you’ve added asthma to your repertoire, bummer. Always glad to see you though, thanks for dropping by.